Absolute Trophy 8.8 acre riverfront property with luxury Timber Frame home and guest house handcrafted by renowned Hamill Creek Timber Homes. This home has been meticulously planned to the highest quality and boasts top of the line superior construction materials including EDCO Arrowline slate shingles, Canexel Ultra Plank Siding, metal clad alder windows, interior solid alder wood doors, Woodcrest Integra weathered slate cabinets with glass infill, hickory hand scraped heated wood floors on main and solid fir floors upstairs. When only the best will do! Flowing open spaces, spacious rooms and designed with entertaining in mind. Custom exposed clear fir posts and beams, authentic wood joinery throughout. Relax in your vaulted living room by the Renaissance wood burning fireplace with a 21 foot high custom stone chimney treatment. Private loft style upstairs is surrounded by exposed rafters and fir trim and is currently fitted as owners private oasis. Master bedroom with walk-in closet and massive en-suite which includes a Jacuzzi tub, oversized walk in European glass tile shower, and his/her sinks, plus separate sitting area and office/den that could be a second bedroom upstairs. Additional guest bedroom on main level with private access to full bathroom. Main house is just under 2000 sqft Plus 900 sqft detached 1 bedroom guest suite above the 30x30 garage. Garage suit is complemented by exposed trusses and vaulted ceilings to mimic the tasteful mood of the main house. Guest suite offers spacious great room, kitchen, bedroom and full bath including sauna. A perfect 4-season package for the most discerning recreational buyer. 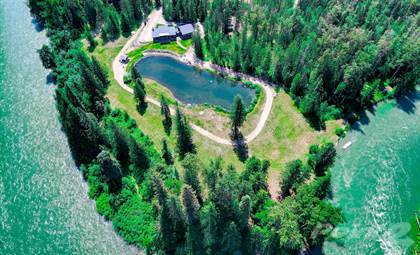 Plenty of lawn and garden areas, private pond and tiki bar, and over 1000 ft of accessable river frontage with a sandy beach and a dock to watch the salmon spawn at your feet. Enjoy everything the Shuswap and Seymour Arm have to offer including world class back country snowmobiling, boating, fishing, hunting, hiking. Hi, I'd like to find out more information about 1663 ACORN ROAD. Thanks so much!